Find Better Ideas, Faster ® with a custom offroading trend report, our PRO Dashboard and 80+ categories of premium trend reports. The Off-Roading Trend Report provides a view down the road less traveled by examining emerging trends in the world of off-road vehicles. Various automobile manufactures like Jeep, Ford, Dodge and Land Rover offer 4x4 editions from their vehicle collections capable of traversing over rough terrain and natural environments. Smaller recreational all-terrain vehicles with off-road capabilities also provide consumers with an opportunity to explore a world away from the beaten path. This report provides an excellent examination of off-road vehicles ranging from large automobiles to smaller recreational vehicles. Professionals in industries covering the world of adventure vehicles, off-road sports and outdoor recreation will gain a better insight into contemporary innovations and consumer behaviors. 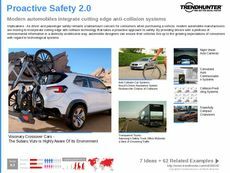 The Off-Roading Trend Report provides a fully realized rundown focusing on the world of all-terrain vehicles and fully equipped 4x4 autos. The contents of this report will be of special interest for anyone designing, marketing or selling off-road vehicles.